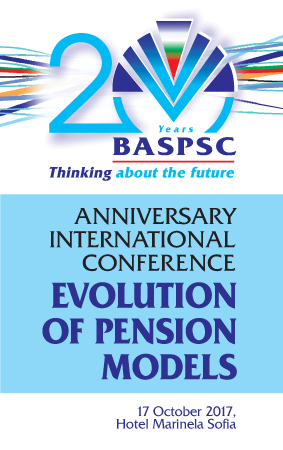 The Financial Supervision Commission has approved a minimum rate of return of -11.45 % on an annual basis, resulting from the management of the Universal Pension Funds’ assets for the preceding 24-month period considered from 28 September 2007 till 30 September 2009, while for the same period of time the minimum rate of return for the Occupational Pension Funds has been determined at -13.06% on an annual basis. The Bulgarian pension system is working quite well - thinks мr. Angel Martinez-Aldama, Chairman, European Federation for Retirement Provision (EFRP). We suggested that the policy of reducing social contributions rates needs to be reassessed. Bulgaria should continue undertaking measures to increase social security revenue by eliminating the abuse of paying contributions on the minimum wage as well as to include high wages in the insurance base and by facilitating longer working lives. Jung Lichtenberger, European Commission in Brussels. The Financial Supervision Commission has approved a minimum rate of return of -9.41 % on an annual basis, resulting from the management of the Universal Pension Funds’ assets for the preceding 24-month period considered from 29 June 2007 till 30 June 2009, while for the same period of time the minimum rate of return for the Occupational Pension Funds has been determined at -11.14% on an annual basis. BUCHAREST (RO), 11.06.2009. Romania`s financial arrangement with the International Monetary Fund (IMF), that was made available to the open public last night at Washington, safeguards the Romanian mandatory private pension system (Pillar II) by stating that the Government would return to the initial calendar to increase contributions directed to the private pension funds. According to the Romanian pension reform law, that introduced the second pillar of mandatory private pensions in 2007-2008, the rate of contributions directed to private pension funds is 2% of participants` gross income in 2008, 2.5% in 2009, 3% in 2010, etc., to reach 6% in 2016. The Financial Supervision Commission has approved a minimum rate of return of -9.36 % on an annual basis, resulting from the management of the Universal Pension Funds’ assets for the preceding 24-month period considered from 30 March 2007 till 31 March 2009, while for the same period of time the minimum rate of return for the Occupational Pension Funds has been determined at -10.82% on an annual basis. On 27th March 2009, the FSC adopted amendments and supplements to Regulation No 9 on the manner and procedure for valuation of assets and liabilities of supplementary pension funds and pension companies, on the fund’s net asset value, for calculation and disclosure of the unit value and on the requirement to maintenance of individual accounts. The amendments to the regulation are a result of the experience gained in relation to its implementation, of the necessity of harmonization of the terminology with the Act on Markets in Financial Instruments and the precision of certain provisions. The regulation provides that in the cases when, by 12 o’clock on the day of the valuation, there is no redemption price for buy-back of shares, units, respectively, issued by a collective investment scheme, their valuation is performed by the latest announced price and the pension company notifies the deputy chairman of the FSC of that. The purpose of this amendment is to harmonize the valuation done by the pension companies concerning the same shares or units of collective investment schemes. Another amendment concerns the follow-up valuation of an investment estate by fair value, which will be made as of the last business day of each quarter by an independent valuer licensed for real estate valuation in accordance with the Act on Independent Valuers. According to the previous legislation, this valuation was only made twice per year. The purpose of the change is to allow the pension companies to be more flexible and to react more adequately to the changes in real estate prices. The amendments come into effect on 1st July 2009. The deputy chairperson of the Financial Supervision Commission responsible for the Social Insurance Supervision Division adopted Decision No 278- PIC which amended the Requirements to the advertisements and written information materials of pension funds and pension companies under art. 123i, para 2 and art. 180, para 2, item 1 and item 2 of the Social Insurance Code (the Requirements). The current objective circumstances related to a persistent decrease of the return of the supplementary pension funds and negative realized return for 2008 imposed reconsideration of the indicators for determining and disclosure of the achieved investment results from supplementary pension fund management and the use of the Sharpe ration in particular. In periods when the return from the asset management is lower than the determined risk-free rate, the Sharpe ratio is negative. If two funds have achieved the same return, lower than the risk-free return, the Sharpe ratio for the fund with the higher standard deviation (i.e. higher risk) is higher. In such cases, the use of the Sharpe ratio is treated in different manners in specialized literature and in the investment circles and its use may be misleading for the fund members. Given this and in accordance with the amendments to the Requirements, the Sharpe ratio will be disclosed only if the nominal return from management of the respective supplementary pension fund is higher than the risk-free return for the period for which the investment results are disclosed. The Social Insurance Supervision Division of the Bulgarian Financial Supervision Commission announced the results from the switching of participation and transfer of funds of fund members from one pension fund to another during the fourth quarter and during the entire 2008, as well as the results from the four administrative distributions of persons who had not selected a supplementary mandatory pension fund (Pillar II). A total of 23 190 fund members from all applicants in the fourth quarter of 2008 have switched their participation in the supplementary pension funds. The total amount of the funds transferred from one pension fund to another of the respective type in the fourth quarter of 2008 is EUR 29 075 thousand. During the entire 2008, a total of 84 748 fund members have used the opportunity to switch their participation in supplementary pension funds and have transferred a total of EUR 113 647 thousand from one pension fund to another of the same type. Compared to 2007, the number of persons who have switched their participation has decreased by 9.40 per cent and the amount of transferred funds has decreased by 1.16 per cent. In 2008, a total of 99 972 persons were distributed administratively among supplementary mandatory pension funds of which 85 872 persons were distributed to universal pension funds and 14 100 persons were distributed to occupational pension funds. Persons distributed to universal pension funds in 2008 constitute 52.21 per cent of the total number of persons (from new applications and administratively distributed persons) and 70.91 per cent – to occupational funds. The Financial Supervision Commission has approved a minimum rate of return of -6.98 % on an annual basis , resulting from the management of the Universal Pension Funds’ assets for the preceding 24-month period considered from 29 December 2006 till 30 December 2008, while for the same period of time the minimum rate of return for the Occupational Pension Funds has been determined at -8.51% on an annual basis.